Goodbye 2018, it was fun… hello 2019. With the new year comes new opportunities especially when it comes to planning your social media marketing strategy. When considering the best way to attract and engage new prospects and grow your business, it’s a great time to take a look at what trends are currently sweeping the digital marketing space. Here’s a sneak peak at our top 5 social media trends for 2019 that we will be incorporating into our marketing strategy. Frank Kern, digital marketing guru, came out recently and said “If you’re depending primarily on email to grow your business in 2019 you’re in trouble“. He and many others are finding their email database open rates and conversions are declining, because of email-overwhelm maybe or our growing need for instant gratification. The shift is towards prospects engaging with brands directly via private message or social media newsfeeds. What we’re planning for 2019: Kerwin and the K-Team have been dedicated to building engaged audiences across all the social media platforms since mid-2016. We have a renewed focus on growing our audiences around segmented topics so we can deliver the most relevant content to each of our audience groups. We’re doing this with Facebook Audiences and by segmenting our email database. We’re not ignoring email. Besides segmenting our email subscribers so we can better serve them, we are developing our ‘subscription’ content strategy where our email subscribers will receive unique content created specifically for them, content that can’t be accessed anywhere else. You can sign up for our VIP Newsletter. You probably follow personal brands like Kerwin, Gary Vaynerchuk, Tony Robbins because of this… More and more, brands which stand out from others are those that are willing to be raw and real, admit their mistakes and be honest with their audience. Prospects can see through “perfect lives” and “perfect brands”: they crave authentic, “real” interaction with businesses and brands which they feel genuine affection and affinity. What you can do in 2019: Start by adopting a transparent, authentic way of communicating with your audience. It’s a great way of promoting real, longer-term engagement and build the “know, like, trust” factor that is essential for conversion. If you’re afraid of being authentic, remember it’s not about you, your audience really only cares about the value you bring to their lives. A trend which we expect to evolve in 2019 and in the same vein as the “Authenticity” trend above, is “keeping it real” in terms of the content that’s posted on social media. Pre-prepared or over-produced content is giving way to a trend which involves live video, chat and interaction. Live communications give customers the chance to get a real flavour of how a business operates and the people behind the brand. By being authentic, there is the opportunity to develop lasting empathy and genuine warmth between businesses and their customer base. What we’re planning for 2019: Part of Kerwin’s social media engagement strategy for 2019 includes more live and raw content delivered via the ‘stories’ feature (see next trend); faster responses to private messages and higher level of community management across all the platforms. We’re also developing our Facebook Messenger Bot strategy and will be looking to install a ‘live chat’ feature on our website. Started by Snapchat way back in 2013, stories are valued by users not only for their visual appeal and easy of access, but also for the fact that they are constantly changing. With content normally available for only 24-hours, depending on the platform, there is real pressure on followers to check back regularly to see what’s new, or risk missing out. It’s that FOMO (fear of missing out) factor. Unlike a social media newsfeed which is passive, stories requires the follower to ‘seek-out’ the content making them more liking to engage. Instagram Stories is the most successful of the platforms that are getting on the ‘ephemeral’ content bandwagon, Facebook and YouTube now have their own versions and LinkedIn has been rumoured to be rolling out its own as I write this. What you should plan for 2019: Plan to learn how stories work and schedule time to create suitable content to post every day if possible. Go check out your competition or leaders in your industry and see what they are doing with stories. Remember that stories are less formal than timeline content, so have fun with it. Although video has been around for a while, it’s likely to dominate even more in 2019. With figures showing a clear divide in short ‘snack-able’ videos (ideal for Facebook and Instagram) and long-form videos (suited to YouTube). What we’re planning for 2019: We’ve added clear goals to our 2019 social media strategy including creating custom unique video content optimised for each of the platforms as well as plans for longer ‘film’ length videos. So keep an eye out – subscribe to the YouTube channel. Artificial Intelligence (AI) is going mainstream and coming into reach of most tech savvy marketers and business owners. There are currently a number of message chatbots on the market (like ManyChat) which can easily be setup to respond to messages and requests from customers in a natural manner. The major advantage of a chatbot is that it can respond at any time, often providing useful responses to common queries in a way that resonates with visitor. AR allows users to enjoy computer-aided visuals that add enormously to their experience. From the early AR employed by Snapchat (originator of the face filters), other platforms (like Instagram) have caught on to the trend. It’s likely that AR features such as games, face filters, bitemojiis and others are likely to be commonly employed by not only Instagram, but also adopted and expanded on by Facebook allowing businesses and brands to provide their customers a unique interactive digital service. For example, allowing users to virtually try on clothing, makeup or glasses without visiting the retailer, or walking through house designs without leaving home. Very exciting stuff. Most people are aware of influencers: people with enormous followings on one or more social media platforms who can raise exposure and boost engagement for brands, people, ideas and products by simply ‘recommending’ them to their audience. If you’ve got a smaller budget or are just starting out, micro-influencers (often defined as people with between a thousand and ten thousand followers), can often promote your brand or the products you offer for a relatively modest fee, getting your name out there without breaking the bank! Look for profiles that have your ideal target audience and approach them to promote you or suggest a joint venture – you promote them, they promote you. Win / Win. One thing is for sure, the social media landscape is forever in flux, as businesses, brands and marketers we need to find ways to stay on the edge or risk being left behind. Keeping up with what others are doing is vital if you and what you have to offer is going to stand out from the rest for all the right reasons in 2019. Many of our listed trends can be incorporated into your marketing relatively easily, as simple as planning it in, but making the effort has the potential of making a real difference to your bottom line over time. What social media marketing trends will you incorporate in to your 2019 strategy? I’d love to know, leave your message in the comments below. 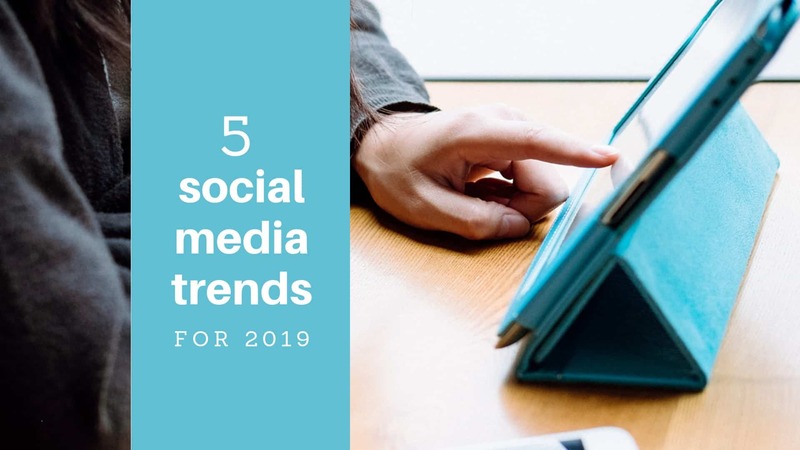 This post Top 5 social media trends we are focusing on in 2019 appeared first on Kerwin Rae.